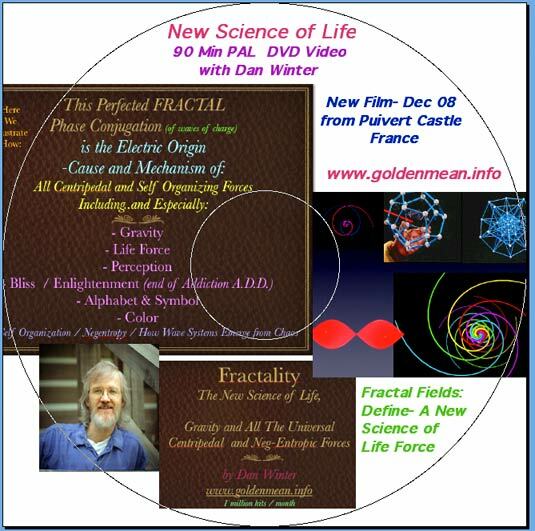 A New SCIENCE OF LIFE: Fractality and the Phase Conjugate BIOACTIVE Field..
Additional European Tour Conference Options for 09 - Coming up- with Dan Winter- see below! New Science of LIFE! .... in Spirit of Giambatista Vico's Origin New Science of Life..
we Present the REAL Science.. how did the Pyramid Cement Polymer Effect DNA Growth??? Could this secret of LIFE FORCE- be Applied Today? THE DVD IS NOW AVAILABLE- WE ARE PROUD TO PRESENT HERE.. This presentation is in English- a Prelude to the Dec 30 (Tomorrow) Presentation in FRENCH and ENGLISH- in Perpignan - Aero- St. Esteve- see below..
Dec21: Web editors note: the response to Dan Winter's newest film on Alchemy of Death- has been so overwhelming - that it has almost toasted our server (apparently not fractal enough to do perfect compression - so it may not survive death..). 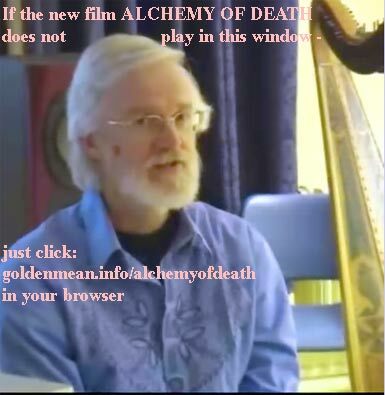 Dan Winter fan's are encouraged to replicate this - and his film library (goldenmean.info/implosionmovies ) on other public video servers- please always mention goldenmean.info . 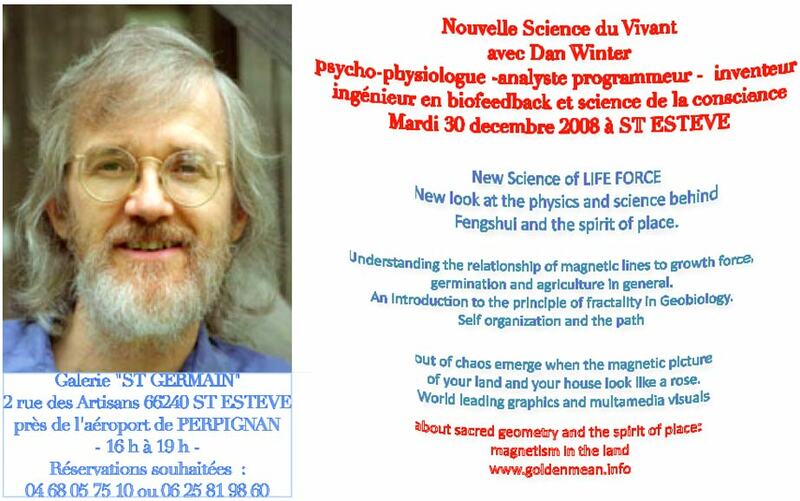 Also new on the Web: Dan Winter's Famous Classic Film: THE PURPOSE OF DNA - Complete in 12 Parts- In English with Polish Subtitles..
Nous proposons une après-midi en compagnie de Dan Winter le 30 décembre à partir de 16 heures - 2, rue des Artisans à St ESTEVE près de l'aéroport de Perpignan. Même si nos activités semblent nous diriger pour un temps vers la Grande Bretagne, notre attachement pour la France et la région pyrénéenne demeure. Cette rencontre sera l'occasion de vous faire part des dernières découvertes dans les biotechnologies. Cédric Mannu de formation scientifique et littéraire et mystique a le parfait mixte pour aborder la complexité d'un esprit disons aussi "génial" que celui de Dan. Cédric pourra nous aider à décrypter les toutes récentes approches d'un esprit en éveil vers de nouvelles découvertes toujours plus extraordinaires. Nous vous adressons tous nos voeux de bonheur et d'harmonie et de paix pour 2009. ( compagne et aussi traductrice de Dan Winter ). 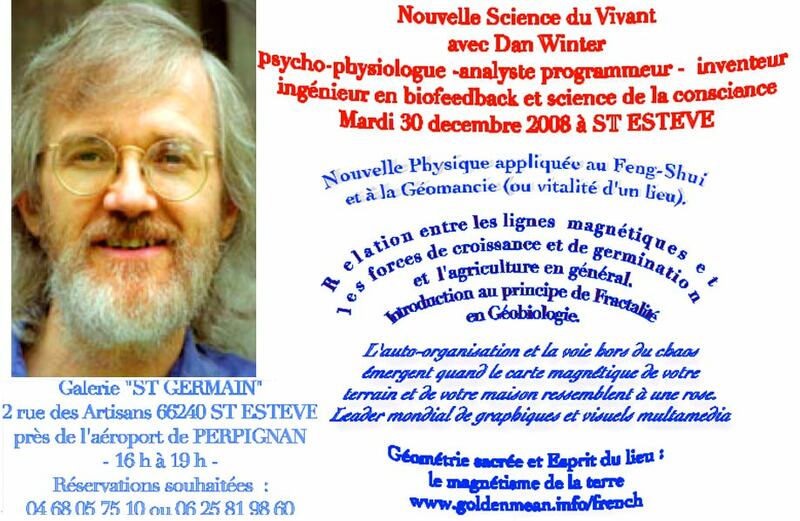 We propose an afternoon in company of Dan Winter on the 30th of December starting from 4PM at 2, rue des Artisans at Saint ESTEVE near Perpignan Airport. Even if our activities seem directed for the time being towards UK, our attachment for France and the Pyrenees area remains. This meeting will be an opportunity to share with you the latest discoveries in biotechnologies and consciousness research. Cedric Mannu trained in Science and also literature and mystic has the perfect mix to access the complexity of a genius mind like Dan's. Cedric could help us o decipher all the recent approaches of an awake mind towards new discoveries always more extraordinary. We address you all our wishes of happiness, harmony and peace for 2009. Une introduction au principe de Fractalité en Géobiologie. de votre terrain et de votre maison ressemblent à une rose. New look at the physics and science behind Fengshui and the spirit of place.Understanding the relationship of magnetic lines to growth force, germination and agriculture in general. An Introduction to the principle of fractality in Geobiology. Self organization and the path out of chaos emerge when the magnetic picture of your land and your house look like a rose. 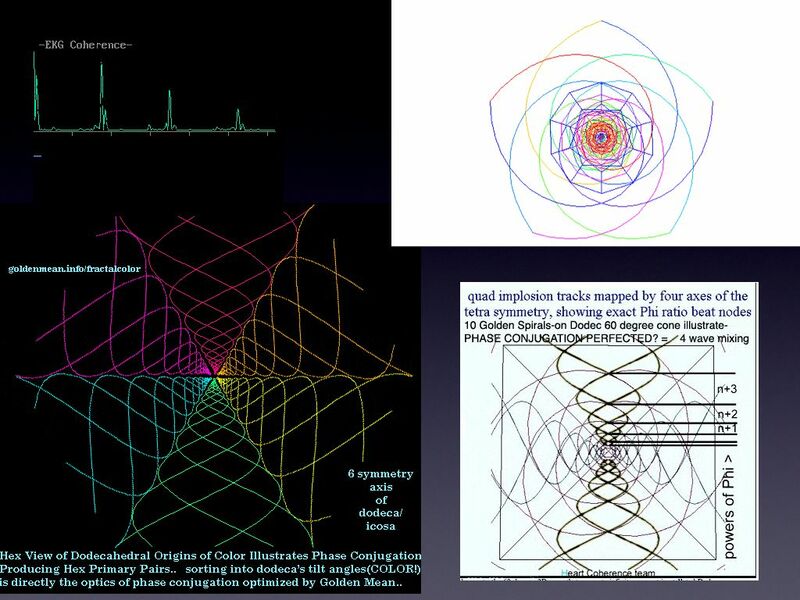 World leading graphics and multamedia visuals about sacred geometry and the spirit of place: magnetism in the land. 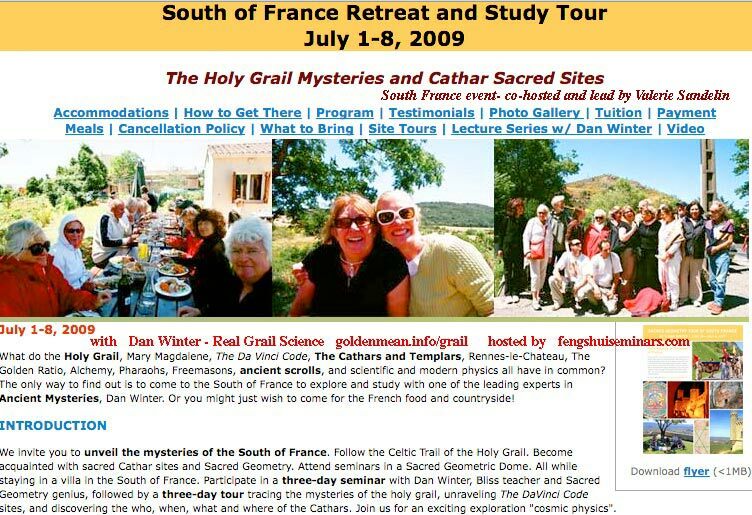 Or Join us for some SERIOUS FUN-- later in the Summer here in France! Finally- exerpts from the Slide Show- as at : goldenmean.info/budapest08 - on the New Science of Phase Conjugates and LIFE! !